made from 14 gauge copper wire. Once it was finished I ran it through the tumbler to work harden and polish. It would make a great gift for a man or woman. It can be found in my Handmade Artists Shop. 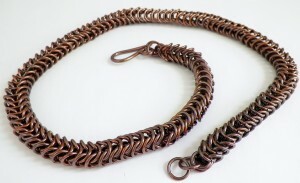 Have you made any chainmaille jewelry?